Once again, we’d like to thank everyone who stuck with us and posted comics while we were out dicking around playing video games and occasionally working on buffer. You guys are all awesome. There’s not much to this update, just a nice little cover page. We really need to start being consistent with these things. First two chapters had no title page, Ash chapter just had Chapter 3 with no name, The Date chapter just kind of had the words “Chapter 4″ thrown into a page, and now we have this. Maybe one day we’ll go and draw legitimate chapter covers for each page because it’s really buggin’ me. But hey, how about the one here? As you may remember from my previous hints and outright statements, this chapter will be focusing on Derrick and Hai, the titular pair of rapscallions who appeared for a whole three pages in the pet-hunting chapter. So no Matt, no Ash, no Rinnie, Kim, or Dan. But hey, we also got some new characters! There’s two of them right there, did you notice? What are they like? Are they suitable replacements for the original cast? Who knows! Besides me of course, I wrote them. I’m just trying to force some speculation on you. Did it work? Tell us in the comments so I can read what you think they’re like, tell you “Nuh-uh”, and then completely rewrite them so they’re nothing like what you previously guessed. Awhile ago, I also stated that there was some big news in regards to Leslie and I that we were waiting on an official confirmation of. That’s still happening. We’re just waiting for the damn people to update their site! That’s right, Leslie and I just may be appearing on another website! Whose website? Can’t tell you! You’re just going to have to search through them all until you find us! ALL of the websites. But that’s enough from you, you can probably tell that it’s awfully late here and I’m awfully tired. 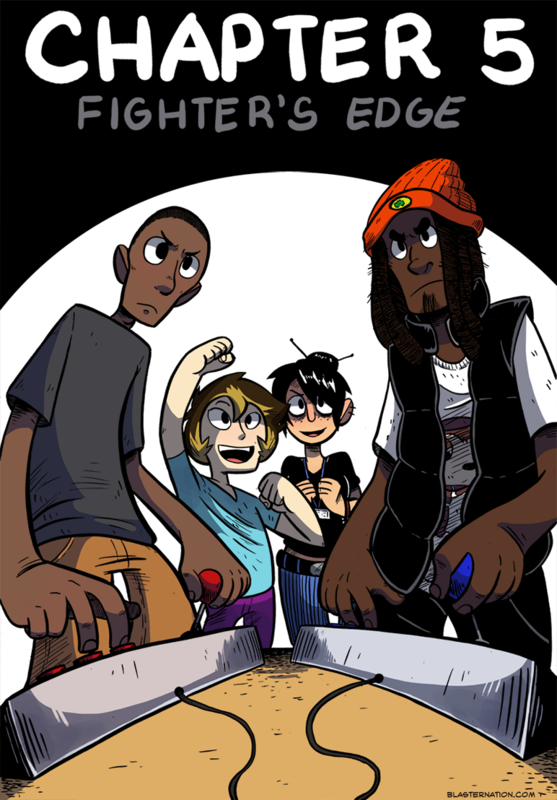 Come back Sunday to get a comic to go with this chapter cover!